If you are looking for a profitable business opportunity in Colorado, you should definitely take the time to check out BBQ & grill cleaning business in Colorado. You can start this business from scratch without having to take out a huge bank loan and prior experience in the BBQ cleaning industry. Yes, this means that you can start your business and learn on the job! Where else can you find business opportunities that allow you to do that? Do keep in mind that we are not talking about franchising. You keep what you earn because there are no royalties to pay on a monthly or annual basis. Each year, The BBQ Cleaner receives high volumes of requests for our services in Colorado. However, we still require more hands on deck to be able to bring our services to more homes in Colorado. That’s where you come in. It is the perfect opportunity for you to set up your own business, flexible working schedules, and your own service rates to capitalize on increasing market demands. Why Start a BBQ Cleaning Business in Colorado? Favorable Weather Conditions: Colorado typically sees less moisture as it is a high desert. It has more sunny days per year than Florida, and that’s why you can expect families to be out grilling. This means that you have a higher chance of meeting the needs of those who need grill cleaning services. There is a Never-ending List of Leads to Tackle: A wide range of Colorado homes are equipped with their own grills. You have the opportunity to tap on a large base of potential customers. Lower Number of Competitors: You need to be innovative if you are planning to enter a highly competitive niche. BBQ grill cleaning in Colorado is different as you can look forward to little competition. Scaling Your Business will be a Breeze: If you suddenly have a longer list of customers to serve, simply add more vehicles and hire more staff to meet your growing business needs. How Does The BBQ Cleaner Help You Get Started in Colorado? The BBQ Cleaner aims to help you grow your business successfully. That’s why we provide on-going lifetime business support that you can access 24/7. What’s more, we offer an all-in-one package to help you get started. We got you covered in the form of brochures, print outs, and more. Our company is established in 2009 and we have nearly 200 operators nationwide to date. When it comes to BBQ and grill cleaning, we are a global leader that can help you unlock unlimited earning potential. 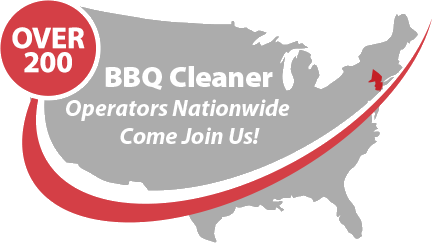 Talk to us today to find out more about this stellar BBQ cleaning business opportunity in Colorado!